It's never too early to start thinking about the 2016 presidential election. While you may change your mind later, tell us who you'd currently like to see as the GOP nominee. Instructions: ConservativeHQ.com's GOP Presidential Straw Poll is available exclusively to registered CHQ members. To register, click here. If you are already a member, please log-in by clicking here. You may vote once a month by clicking on the button next to ONE candidate's name at the bottom of this (don't click on the photos). Review the choices FIRST before adding a write-in candidate. Submitted by David Givens on Fri, 08/22/2014 - 12:05. 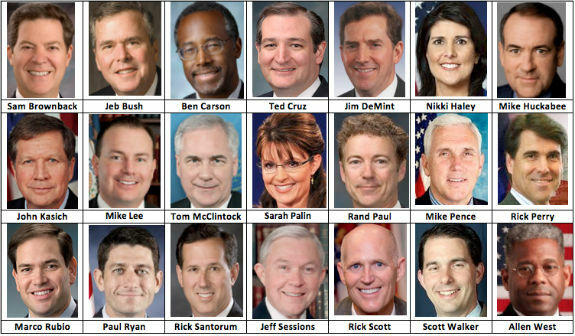 I want a conservative Republican dream team! For several months now you have been conducting a monthly presidential straw poll. Gov. Sarah Palin has consistently overwhelmed the opposition — individually and collectively. I would like a campaign with a proposed Republican administrative TEAM. Palin will be President she is the most Reaganesque, conservative, small-government, balanced-budget candidate on the scene. Speaker Newton “Newt” Gingrich will head up a Department of Foreign Affairs which will control the Bureaus of Defense, State and all other U.S. government functions overseas. Mr. Herman Cain will be secretary of the Interior charged with shutting down all unnecessary, and redundant Federal organizations and selling all necessary federal functions that can be done more efficiently by private industry. He has years of experience at making organizations more efficient. Gov. Willard “Mitt” Romney is also perfect for this position but I have better position in mind for him. As Vice President/Chief of Staff, he can still be intimately involved. His main job as V.P./C.o.S. will be to run the day-to-day operation of the government. Sen. Randal "Rand" Paul will be the Secretary of the Treasury charged with getting the United States off fiat money. All other candidates, proposed candidates and suggested candidates can be folded into one of these four offices. Like the captain of a ship, Palin will be in command and establish the direction of the country. They will all run for president as a team! THIS COMMENT WAS CLIPPED FOR LENGTH. Submitted by constitutionave on Fri, 08/22/2014 - 12:37. Do you plan on posting this same comment on every presidential poll? It's honestly getting old by now. And NO, Mitt Romney shouldn't occupy ANY high federal office, VP or otherwise. Submitted by jwagner on Thu, 08/07/2014 - 15:44. “We the People” had better start showing our support for Sarah soon, or we’ll miss the opportunity. She’ll not run unless she sees that she has overwhelming support; I don’t blame her. Sarah would mop the floor with any candidate the democrats run. She has brains and proven character, both vital for standing up to the tyranny here and abroad. Give her a united traditional Congress and we will see an America return to Constitutional principles and ideals. Submitted by Allergg on Tue, 08/19/2014 - 18:53. Sarah Palin TWICE save the GOP from oblivion. She pulled off her first 'Lazarus' moment in 2008 as the surprise VP candidate with Johny McNasty. She raised McCain's extremely low polling up to just about even with the totally unknown Obama but just a couple of points behind. McCain spent to much time "reaching accross the aisle". Then in 2010 she did it again with the Congress. Both times, the GOP had been fading fast. Campaign contrabutions had dried up. The GOP was on its last legs. Today, those party officials who "lead" the GOP display absolutly no thankfulness toward her. Without Palin's two "Lasarus" moments, they'd have little to no campaign contrabutions. Mega Wall Streeters had long switched to Obams as their favorite candidate because, after all, the Democrats were in the ascendency. The GOP was a loser. Unfortunatly the GOP has not learned its lesson. The elites of the GOP and the GOP's party officials apparently have contempt for TEA Partiers and middle class rank-and-file Republicans. The elites of the GOP are far more interested in perpetuating the "global" economy than the US economy. GOP party "leaders" have become wholly dependent upon unloyal multi-national corporations for the largess. Submitted by David Givens on Fri, 08/08/2014 - 15:29. Hillary is easy to beat. Beat her with ObamaCare which is just a rewording of HillaryCare. Beat her with Benghazi. Every pro-Hillary ad should be followed by the 10 second clip of a strident Hillary shrilly screaming, “At this point, what difference does it make?” Beat her with a girl. Any criticism of Hillary by a male will be purported to be a sexist beating up on a girl — “war on women.” Get a Reaganesque, conservative, small-government, balanced-budget WOMAN to challenge Hillary’s coronation. The best one on the scene is Gov. Sarah Palin — if we can persuade her to run. Palin is also our best choice if the Democrats run Sen. Elizabeth Warren or First Lady Michelle Obama. Who else do the Democrats have to run — Joe Biden. Joe would beat himself. Palin can't get the women's vote! Submitted by [email protected] on Fri, 08/15/2014 - 16:58. How would you know about the "women's vote"? Submitted by constitutionave on Sun, 08/17/2014 - 12:51. From what perspective do you make this broad-sweeping generalization? Your email address indicates that you are a male, NOT a female. Or maybe you are a lefty troll. I happen to be a female who has managed and been involved in hundreds of campaigns. I believe Sarah Palin can obtain the majority of CONSERVATIVE female votes, but since liberal women (I used to be one) tend to focus on the negative qualities of conservative, attractive females, it is more difficult for female Republicans to get cross-over votes. But that's true of nearly any female conservative candidate and NOT isolated to just a Palin candidacy. Plus, Palin won't run. HERE'S A TIP: posting your email address publicly is going to get you hacked and mega-spammed, big time. Not smart. Submitted by David Givens on Mon, 08/18/2014 - 13:11. Several months ago, I sent the following message to Gov. Palin. I don't know if she got it or not. I recommended she include the following in one of her speeches. “Every president in my lifetime has gone into office a handsome, vital man and come out a gray and haggard husk. This message will demonstrate that you do not take yourself too seriously.